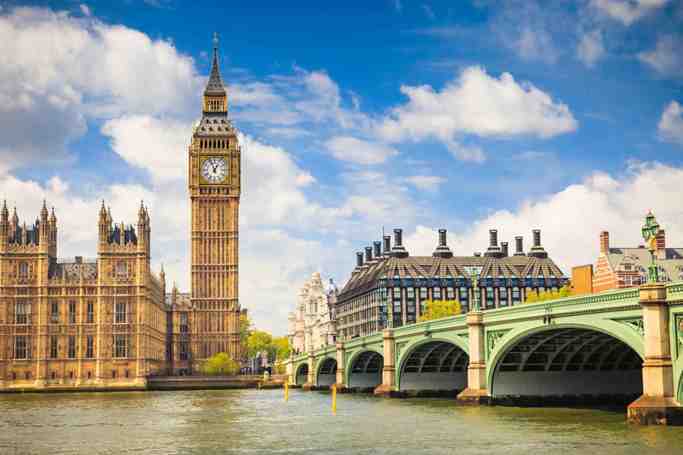 The cathedral is one of the most famous and most recognisable sights of London. Its dome, framed by the spires of Wren's City churches, dominated the skyline for 300 years. At 365 feet high, it was the tallest building in London from 1710 to 1967. The dome is among the highest in the world. St Paul's is the second-largest church building in area in the United Kingdom after Liverpool Cathedral. St Paul's Cathedral occupies a significant place in the national identity. It is the central subject of much promotional material, as well as of images of the dome surrounded by the smoke and fire of the Blitz. Services held at St Paul's have included: the funerals of Lord Nelson, the Duke of Wellington, Sir Winston Churchill, and Margaret Thatcher; jubilee celebrations for Queen Victoria; peace services marking the end of the First and Second World Wars; the wedding of Charles, Prince of Wales and Lady Diana Spencer, the launch of the Festival of Britain and the thanksgiving services for the Silver, Golden and Diamond Jubilees and the 80th and 90th birthdays of Elizabeth II. 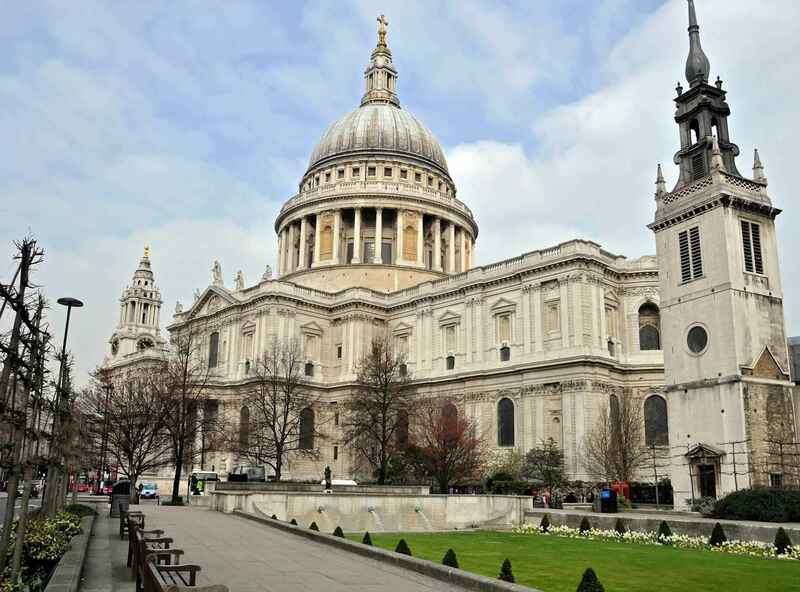 St Paul's Cathedral is a working church with hourly prayer and daily services. St Paul's Cathedral is built in a restrained Baroque style which represents Wren's rationalisation of the traditions of English medieval cathedrals with the inspiration of Palladio, the classical style of Inigo Jones, the baroque style of 17th-century Rome, and the buildings by Mansart and others that he had seen in France. It is particularly in its plan that St Paul's reveals medieval influences. Like the great medieval cathedrals of York and Winchester, St Paul's is comparatively long for its width, and has strongly projecting transepts. It has much emphasis on its facade, which has been designed to define rather than conceal the form of the building behind it. In plan, the towers jut beyond the width of the aisles as they do at Wells Cathedral. Wren's brother was the Bishop of Ely, and Wren was familiar with the unique octagonal lantern tower over the crossing of Ely Cathedral which spans the aisles as well as the central nave, unlike the central towers and domes of most churches. Wren adapted this characteristic in designing the dome of St Paul's. In section St Paul's also maintains a medieval form, having the aisles much lower than the nave, and a defined clerestory. Wren drew inspiration from Michelangelo's dome of St Peter's Basilica, and that of Mansart's Church of the Val-de-Grâce which he had visited. Unlike those of St Peter's and Val-de-Grâce, the dome of St Paul's rises in two clearly defined storeys of masonry, which, together with a lower unadorned footing, equal a height of about 95 feet. From the time of the Greek Cross Design it is clear that Wren favoured a continuous colonnade (peristyle) around the drum of the dome, rather than the arrangement of alternating windows and projecting columns that Michelangelo had used and which had also been employed by Mansart. Summerson suggests that he was influence by Bramante's "Tempietto" in the courtyard of San Pietro in Montorio. In the finished structure, Wren creates a diversity and appearance of strength by placing niches between the columns in every fourth opening. The peristyle serves to buttress both the inner dome and the brick cone which rises internally to support the lantern. Internally, St Paul's has a nave and choir in each of its three bays. The entrance from the west portico is through a square domed narthex, flanked by chapels: the Chapel of St Dunstan to the north and the Chapel of the Order of St Michael and St George to the south. The nave is 91 feet (28 m) in height and is separated from the aisles by an arcade of piers with attached Corinthian pilasters rising to an entablature. The bays, and therefore the vault compartments, are rectangular, but Wren roofed these spaces with saucer-shaped domes and surrounded the clerestorey windows with lunettes. The vaults of the choir are decorated with mosaics by Sir William Blake Richmond. The dome and the apse of the choir are all approached through wide arches with coffered vaults which contrast with the smooth surface of the domes and punctuate the division between the main spaces. The transepts extend to the north and south of the dome and are called (in this instance) the North Choir and the South Choir. The choir holds the stalls for the clergy, cathedral officers and the choir, and the organ. These wooden fittings, including the pulpit and Bishop's throne, were designed in Wren's office and built by joiners. The carvings are the work of Grinling Gibbons who Summerson describes as having "astonishing facility", suggesting that Gibbons aim was to reproduce popular Dutch flower painting in wood.Jean Tijou, a French metalworker, provided various wrought iron and gilt grills, gates and balustrades of elaborate design, of which many pieces have now been combined into the gates near the sanctuary. St Paul's charges for the admission of those people who are sightseers, rather than worshippers. Outside service times, people seeking a quiet place to pray or worship are admitted to St Dunstan's Chapel free of charge. On Sundays people are admitted only for services and concerts and there is no sightseeing. The charge to sightseers is made because St Paul's receives little regular or significant funding from the Crown, the Church of England or the state and relies on the income generated by tourism to allow the building to continue to function as a centre for Christian worship, as well as to cover general maintenance and repair work. 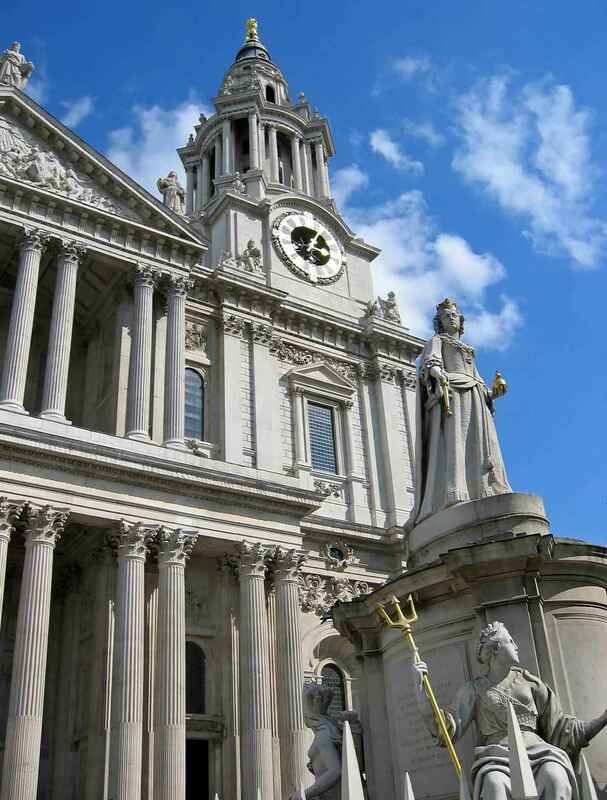 St Paul's Cathedral | eTips Inc.